Josh Lambo kicked two field goals and host Jacksonville’s defense shut down Andrew Luck and the Indianapolis Colts’ offense in a 6-0 victory Sunday afternoon. The Jaguars (4-8) ended a seven-game losing streak at the end of a week that began with the firing of offensive coordinator Nathan Hackett and the benching of quarterback Blake Bortles. The changes, which included quarterbacks coach Scott Milanovich taking over the play calling and Cody Kessler replacing Bortles, didn’t produce much offense, but it didn’t matter because of the Jaguars defense. The Colts (6-6) saw their five-game winning streak end as Luck, who earlier in the week was named AFC Offensive Player of the Month for November, wouldn’t produce any points. Lambo kicked a 30-yard field goal with 2:13 left in the first half and added a 37-yarder with 11:45 left in the game. The second field goal hamstrung Luck on Indianapolis’ last two possessions by giving Jacksonville a six-point margin. The Colts drove 45 yards to reach a fourth and 1 at the Jacksonville 19 at the 2:38 mark of the fourth quarter and chose not to try a field goal. Ronnie Harrison sacked Luck for a 10-yard loss, giving Jacksonville an opportunity to run out the clock. Indianapolis forced a punt and started at its 15 with 1:51 remaining and no timeouts. 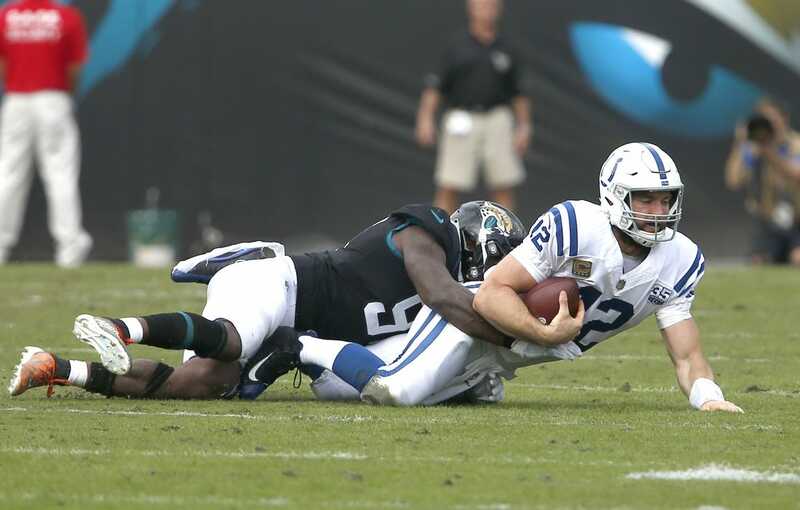 Luck drove the Colts into Jacksonville territory but time expired after his 4-yard completion to Erik Swoope to the Jaguars 25. The Colts got an early scoring opportunity when they started at the Jaguars 42 after Anthony Walker recovered a Carlos Hyde fumble. But three plays later D.J. Hayden intercepted Luck at the Jacksonville 18. Indianapolis had an opportunity to take a 3-0 second-quarter lead when Adam Vinatieri made a 28-yard field goal, but the Jaguars’ Taven Bryan was called for an unsportsmanlike conduct penalty and Indianapolis opted for the first down at the 5-yard-line. It was the first time this season that the Colts have been shut out in the first half. In their last five first halves, the Colts had scored 14, 24, 29, 13, 24 points.